Mistral a Czech record holder! During Saturday June 4, 2016, and early Sunday morning in Jičín, a new Czech record was born. Over 170 pianists managed to break the current Czech record for the longest continuous piano performance. The new record is 20 hours and 7 minutes. This time was also entered into the official Czech Book of Records by the Dobrý den agency. The previous record, created seven years ago in Louny, was therefore beaten by more than 5 hours. 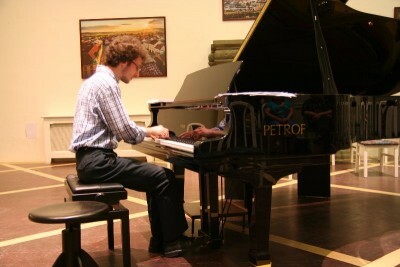 We are very proud that it was a PETROF instrument that played the main part in this event. It is a master piano Mistral, which was purchased from our piano salon and found its home in Jičín two years ago. The company PETROF helped promoting this event mainly on social media websites. Thus increasing the interest of other media and the interest of people of all age groups. During this event, a 6-year-old pianist and a 68-year-old lady have both, for example, played the Mistral piano. Some participants have in fact traveled across the country to be a part of this successful attempt to break the record. After successfully beating the Czech record, the musicians of Jičín are now confident that they can conquer the world record. 125 hours of continuous playing are needed to beat the current world record. We wish them and the Mistral piano the best of luck in this endeavour.